Tri State Rv Repair has registered and certified RV technicians on site so that you can have the confidence in the repairs we do. With combined experience of more than 60 years combind no job is too big. 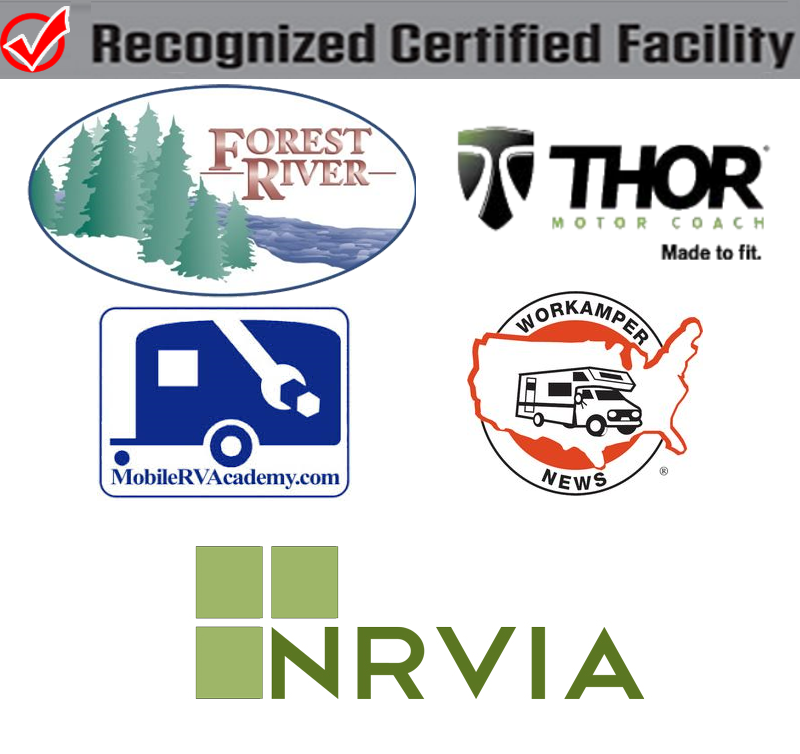 The training that is involved in the registered and certified programs by the RVDA-RVIA makes TriState RV Repair the only choice to bring your RV in for the repairs and services needed to keep you RVing. Our commitment to the proper servicing of your RV begins with extensive and on-going training of our technicians and service writers. We can perform major body repairs, including collision and interior restoration from water damage. Some of our technicians are specialists in roofing and structural repairs for water and leak damage.We also work with major insurance companies as we are first choice. So no matter what the reason Tri State RV Repair is qualified to help you get your RV back on the road. Tristate RV Repair, is the leader in the RV repair industry. We have been servicing the industry for over 18 years. TRR specializes in the upgrading and refurbishing of all types of RV’s and luxury buses. We create and install disco floors and ceilings. Do body and paint work. We do full glass work and work on vinyl, mohawk and wrap down tops. No job is too big or too small. Our expert team of technicians can install full touch control systems for driver and passengers. Triate RV Repair is certified in the installation of all touch screen systems. We are also certified in Air Brakes Systems. We can build our own system, if needed, to save you money. Our D.O.T. Program can certify, re-comply and modify any vehicle for D.O.T. compliance. Our parent company, A.O.T. is U.S D.O.T Certified. We are RV repair specialists. At Tristate RV Repair we are equipped to repair all domestic and imported RV’s to their specifications. Our RV repair service offers work on: engines, transmissions, drive trains, interior and exterior body work, re-upholstery, bars, electronics, sound systems and so much more. At Tristate RV Repair your vehicle will be repaired by trained, experienced, licensed technicians whose goals are the quality and safety of their repairs. We have extensive experience with domestic and foreign RV’s.